Why we need to recover lost data from a Samsung phone with its touch screen can't be used? Some of the data on the phone are very important and the phone may lose meaning when we do not have this data. You can barely make a call without the contacts. Some of the apps also help in utilizing the full potential of the phone. And there is a need to recover the documents since you may refer to them in the future. 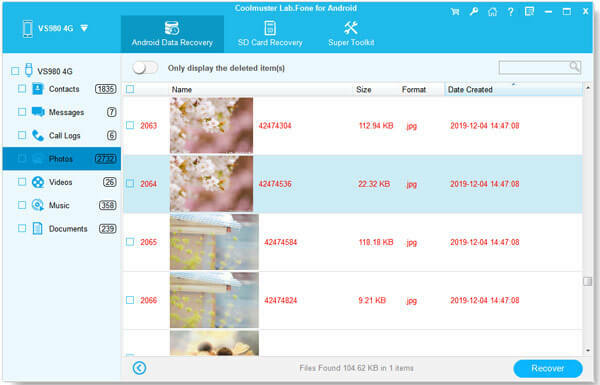 Then, how to recover these files from a Samsung phone with damaged touch screen? 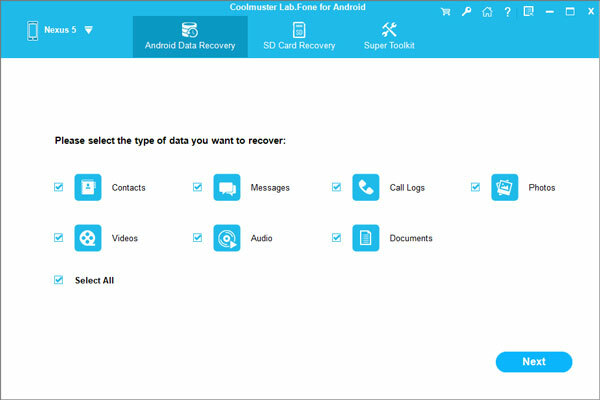 You can turn to Coolmuster Samsung Data Recovery, a professional yet easy-to-use Android data recovery tool to help you recover contacts, text messages, photos, videos, music, call logs and more from not only Samsung Galaxy S7/S7 Edge/S6/S5/S4, but also other Android phones and tablet without any quality loss. It is a standalone program, does not need the installation or support of a third-party program to run it. And with 3 simple steps, you can make it. Then, how to use the Samsung Data Recovery program to recover lost and deleted data on Samsung touch screen can not be used? Please download the trial version of the program for free via the links below and keep on reading the following guide. How to Recover Data from Samsung Touch Screen Cannot be Used? Launch the downloaded and installed Samsung Data Recovery on your computer. Then connect your Samsung phone to the computer via USB. The program detects the connected Samsung phone and show it in interface. Now, you need to choose the file types you want to scan. You can select Contacts, SMS, Call History, Photos, Music, Videos, and Documents. Then, this program will scan the internal and external memory of your Samsung phone deeply. After all the needed files have been selected, you can hit on the "Recover" button and a path choosing dialog will pop up. Just select a place on your computer to save the recovered Samsung data and the recovery process will begin.